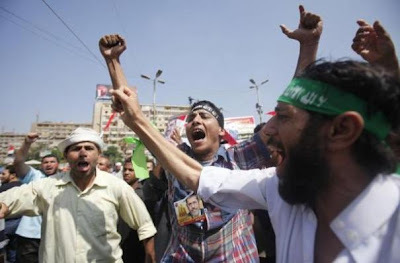 Members of the Muslim Brotherhood and supporters of deposed Egyptian President Mohamed Mursi shout slogans against army after clashes near Republican Guard headquarters around the Raba El-Adwyia mosque square in Nasr City, in the suburb of Cairo July 8, 2013. Islamists burned down a Christian school, paraded three nuns on the streets like "prisoners of war," and sexually abused two other female staff even as at least 58 attacks on Christians and their property were reported across Egypt over the last four days. At least two Christians have died in the attacks.